Ali Center officials say the documentary — "Ali & Cavett: The Tale of the Tapes" — will be shown Nov. 1 in the center's auditorium in Louisville. The film will begin at 6 p.m.
DOTHAN, Ala. (AP) — Already facing a capital murder charge, the Rev. Al Sharpton's half-brother has been arrested again while free on bond in Alabama. NEW YORK (AP) — President Donald Trump's former personal lawyer Michael Cohen and the Rev. Al Sharpton have met to renew a long acquaintance — and they've made a point of letting the public know. Both tweeted about their Friday get-together but left the subject of it a cliffhanger: "I bet you're wondering what we could be talking about! Stay tuned," Sharpton wrote. NEW YORK (AP) — Politicians and religious leaders vowed to ensure immigrant families separated at the U.S. border are reunited swiftly, as a crowd rallied Saturday outside a facility housing children bused from Texas to New York. State Sen. Brian Benjamin's East Harlem district includes the Cayuga Centers shelter where he says 239 immigrant children have been receiving services. The Democrat said the children include a 9-month-old baby and a 9-year-old Honduran boy seeking asylum. WASHINGTON (AP) — Calling on the Trump administration to end its "insensitive policy," the Rev. 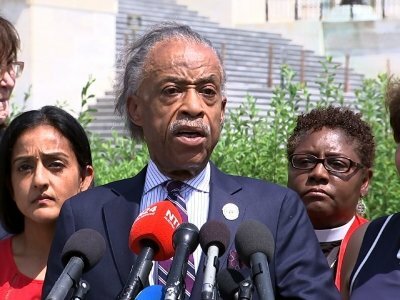 Al Sharpton and a coalition of social justice leaders announced Tuesday that they plan to visit immigrant children separated from their families at the U.S. border with Mexico. In a Capitol Hill news conference, Sharpton accused U.S. officials of applying a different standard to the children "because these are children of color." MOBILE, Ala. (AP) — Rev. 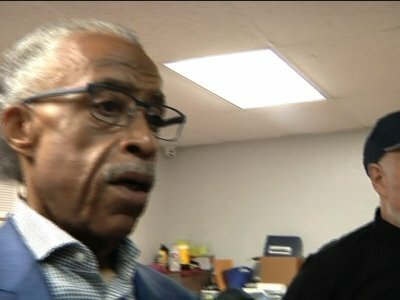 Al Sharpton attended a town hall in Alabama to show support for a black woman whose contentious arrest at a Waffle House sparked anger when the video went viral online. WALA-TV reports hundreds attended the meeting at Bethel AME church in Mobile, Alabama, to show support for Chikesia Clemons. DOTHAN, Ala. (AP) — A capital murder charge against the Rev. Al Sharpton's half brother will be forwarded to an Alabama grand jury. ATLANTA (AP) — Relatives of the Rev. Martin Luther King Jr. led more than 1,000 people on a march Monday in downtown Atlanta, where large crowds gathered 50 years earlier for the slain civil rights leader's funeral procession as a mule-drawn wagon pulled his casket through the streets. NEW YORK (AP) — A survivor of the Parkland, Florida, school shooting joined the Rev. Al Sharpton on Saturday to announce a June rally in front of President Donald Trump's Manhattan apartment to protest gun violence eased by access to assault weapons. Aalayah Eastmond, a junior at Stoneman Douglas High School, was at Sharpton's National Action Network in Harlem for the minister's weekly meetings. JACKSON, Miss. — Sen. Bernie Sanders insists he hasn’t decided whether to run again for president, but a 14-hour sprint across the Deep South on Wednesday made clear that he is not only thinking about it but is already trying to remedy his most significant vulnerability in 2016: his lack of support from Black voters. Police know that President Trump has their backs, and that message is clearer than ever in the wake of the fatal shooting of an unarmed black man by cops in Sacramento, California. The Trump White House has carefully avoided calling into question law enforcement's actions in the March 18 death of Stephon Clark, who was shot eight times by police while holding only a cellphone in his grandparents' backyard. The Rev. 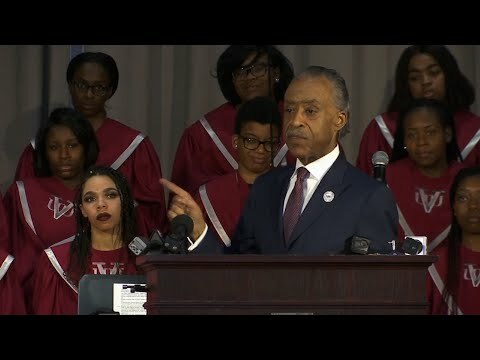 Al Sharpton vowed to press for justice as he delivered the eulogy Thursday for Stephon Clark, an unarmed African-American man shot dead by Sacramento police. The sanctuary at Bayside of South Sacramento Church, called BOSS Church, was overflowing with people, many of whom sat outside as the funeral for the 22-year-old Clark took place. “We will never let you forget the name of Stephon Clark until we get justice,” Sharpton told mourners. SACRAMENTO, Calif. (AP) — A standing-room-only crowd packed into a church Thursday to celebrate the life of a 22-year-old black man who was shot to death by Sacramento police, prompting angry protests in California's capital city and a resolve to force changes in police departments around the country. DOTHAN, Ala. (AP) — The Rev. Al Sharpton's half brother faces a capital murder charge in Alabama, and he's challenging that charge in court. Dothan Police Chief Steve Parrish said the Rev. Kenneth Glasgow drove 26-year-old Jamie Townes around Sunday to look for his stolen car before Townes allegedly shot 23-year-old Breunia Jennings, believing she was the thief. In Alabama, a person aiding or abetting a criminal act is equally liable. SACRAMENTO, Calif. (AP) — The Rev. 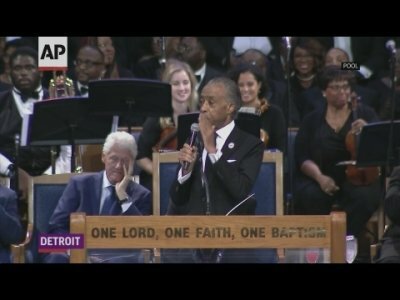 Al Sharpton says he plans to attend Thursday's funeral for an unarmed black man shot to death by Sacramento police officers who say they thought he was holding a gun that turned out to be a cellphone. The civil rights advocate said on his MSNBC program Sunday that he's been concerned by the March 18 shooting of Stephon Clark and doesn't believe it's gotten the media attention it deserves. ATLANTA (AP) — They had gathered to commemorate Martin Luther King Jr., but many of those who delivered speeches on the national holiday created to honor the slain civil rights leaders focused their remarks on another man: President Donald Trump. NEW YORK (AP) — Prominent lawmakers and community leaders took aim at President Donald Trump's racial rhetoric at a commemoration of Martin Luther King Jr.'s birthday. The event was led by the Rev. Al Sharpton, who spoke to a crowd of 200 at the National Action Network in Harlem on Monday. "Trump Tower is in the wrong state," said Sharpton, adding that it's embarrassing that the Republican president is from New York. PHILADELPHIA (AP) — Rev. Al Sharpton said a broken criminal justice system is responsible for Meek Mill's imprisonment and called Monday for the judge who sentenced the rapper to reconsider or step aside. The Rev. 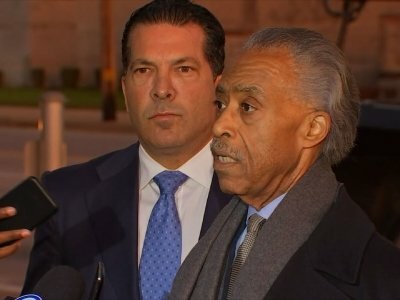 Al Sharpton, founder of The National Action Network (NAN), visited Philadelphia rapper Meek Mill at State Correctional Institution in Chester on Monday. 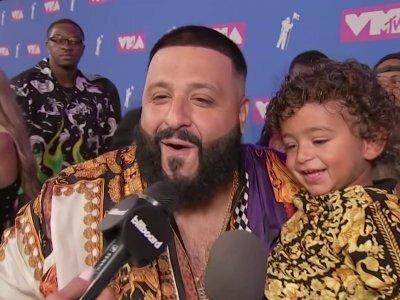 Sharpton said he believes Meek Mill, whose given name is Robert Rihmeek Williams, “represents thousands of people in Pennsylvania, and even tens of thousands around the country,” who are going through the probation system. Philly-born rapper Meek Mill, behind bars for probation violations, got support Monday from the Rev. Al Sharpton, who visited the rapper at the state prison in Chester and emerged pledging to use his clout to help Mill and other prisoners stand up to the criminal justice system. The Rev. Al Sharpton plans to visit rapper Meek Mill on Monday at the Chester State Correctional Institution, where Mill is imprisoned for violating his probation. 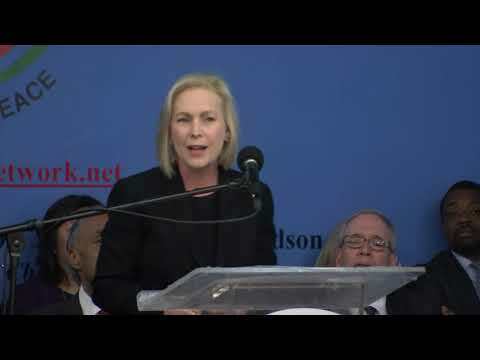 The New York-based civil rights activist will meet with Mill, who has been incarcerated since earlier this month, as part of efforts by Sharpton’s criminal justice reform group, the National Action Network (NAN).